PEDIGREE DENTASTIX Fresh Treats are a snack for large adult dogs. The product is a chewy textured treat that is designed to promote oral health & breath-freshening in adult dogs. 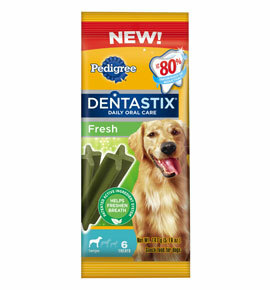 Dentastix Fresh are an X-shape stick-like product with a green color which delivers daily oral care efficacy in a tasty convenient treat. The unique texture is clinically proven to reduce plaque and tartar build-up. Large size for big dogs! Rice; Flour; Wheat; Starch; Glycerin; Sufficient Water for Processing; Gelatin Gum; Arabic Calcium Carbonate; Natural Poultry Flavor; Powdered Cellulose; Sodium Tripolyphosphate; Iodized Salt; Potassium Chloride; Vitamins (Choline Chloride L-Ascorbyl-2-Polyphosphate [Source of Vitamin C]; d-Calcium Pantothenate; Vitamin B12 Supplement; Vitamin A Supplement; Niacin; Riboflavin Supplement; [Vitamin B2]; Pyridoxine Hydrochloride [Vitamin B6]; Vitamin D3 Supplement; Thiamine Mononitrate [Vitamin B1]; Folic Acid; Alpha Tocopherol Acetate [Source of Vitamin E]; Potassium Sorbate (A Preservative); Parsley; Zinc Sulfate; Eucalyptus Oil; Green Tea Extract; Sodium; Copper Chlorophyllin; Copper Sulfate.